Owen Pallett‘s career is roughly analogous to his music itself — multi-layered, complex and abundantly talented. In recent years, he’s concentrated mostly on his arrangement and film score work, which culminated earlier this year in an Oscar nomination for the soundtrack of the film Her. This level of accolade will undoubtedly lead to more well-deserved opportunities for Owen. But his solo career has taken a bit of a back seat over the last four years. Owen’s last album Heartland was released in January of 2010, and his last tour was that Spring, when we experienced an outstanding show at Webster Hall (recording here). 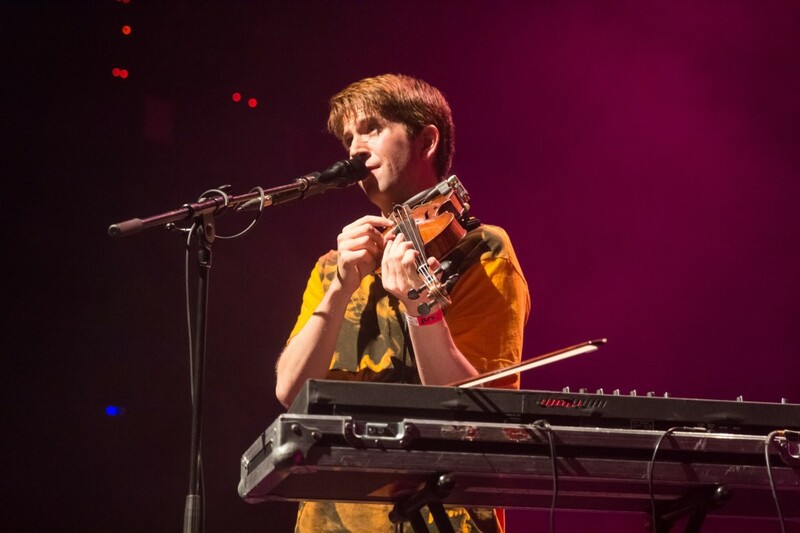 But on May 27, Owen Pallett will release his first new album in over four years In Conflict (Domino Records) and on Tuesday his current tour reached Glasslands. Owen has added a percussionist and a bass player to the live band, but as always the focus is completely on his center position where he mans the keyboard, violin and loop petals to create his own orchestra for each song. The set began with some older material before visiting some of the In Conflict songs, including the title track. Mid-set the band took a break, Owen asked for requests and played three tracks alone. The band returned for the balance of the show, a mix of old an new material. We’re streaming the night’s final song, a power version of “Lewis Takes Off His Shirt” that led to extended and vociferous applause. I left a little extra crowd noise at the end of the show for the listener to understand the enthusiasm of the fans. Owen’s tour has moved on to Europe, but we expect he will be back for Summer or Fall dates in NYC. I recorded this set with our venue-installed Naiant cardioids mixed with an excellent soundboard feed, and the sound quality is superb. Enjoy! If you download this recording from NYCTaper PLEASE SUPPORT Owen Pallett, visit his website, and purchase In Conflict from the Domino Records website [HERE].